Drew Brees set the record for most passing yards, and he did so with consistent accuracy, as he only had three incompletions on the night. Brees was able to strike at every level, moving the chains with underneath throws and also taking part the Washington defensive backs down the field. Tre’Quan Smith had his breakout game after just one catch through the first four weeks of the season. He showed the big strike ability the Saints wanted from him when they drafted the former UCF product in the third round of the 2018 NFL Draft. Smith scored the 62-yard touchdown on a coverage bust. Then, he torched Greg Stroman and caught a well-placed throw to score his second touchdown. Saints first-round pick Marcus Davenport put together a strong performance against Washington’s offensive line, harassing Alex Smith on multiple occassions and recording a strip-sack. Safety Von Bell, a former second-round pick out of Ohio State, made his presence felt in the run game often for the Saints’ defense, picking up multiple stops in the process. One of the few bright spots for Washington was their ability in the first three quarters to limit the Saints’ run game. A big reason for that was the two young defensive lineman from Alabama, Jonathan Allen and Da’Ron Payne, who prevented the Saints from getting their ground game going. Washington’s defense struggled to get any pass-rush against the Saints’ offensive line. Washington did manage to record two sacks, but Brees had all day to pass the ball on almost every other down. Guard Brandon Scherff had a strong night against the Saints’ pass-rush, but the same can’t be said for most of his teammates in the trenches. Center Tony Bergstrom, specifically, had a tough time handling New Orleans’ Sheldon Rankins and David Onyemata. Paul Richardson Jr. had one for the highlight reel early in the contest, as he climbed the ladder to pull down a contested target for a 23-yard gain in the first quarter. He added four more catches for an additional 27 yards to close out the game, as well. The Saints’ offense dominated the game. Brees had all day to find his targets, some of which came wide open and others through accurate passes in tight coverage. 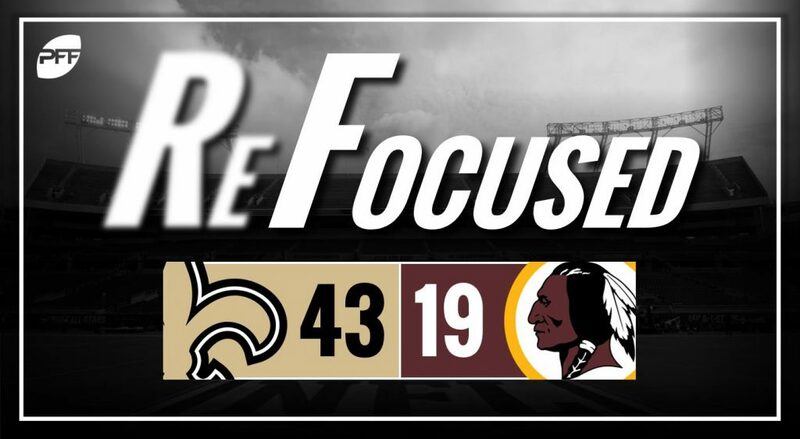 Offensive woes at the hands of Alex Smith and Washington’s offensive line were simply too much to overcome to go toe-to-toe with Brees and the Saints’ offense.